Ever since I first saw the Oriental Adventures event charts back whenever I first saw that they have haunted my DMing brain. ...always seemed to be the tip of the iceberg of something cooler and better that was like it but not quite it. If you have a decent sandbox kit--like the Majestic Wilderlands or some maps you drew yourself--you basically have an atlas. Locate your players in space and that tells you a lot of what you want to know about the adventure they're having that day. The gaps in what you know are filled in with stuff you just made up or with things rolled up on random tables. What the Oriental Adventures macro-event tables were about is creating the session's adventure by combining where the PCs are in physical space with where they are in time. That essentially combines the two inputs--space and time--into a breeder table which spits out a unique adventure without much work every day. 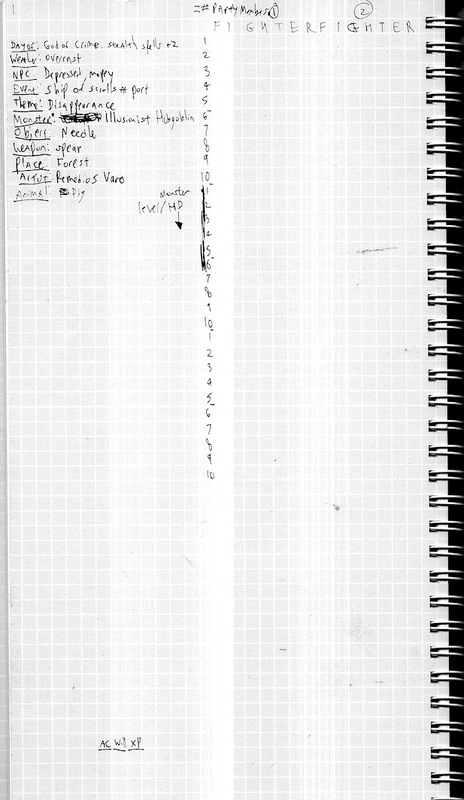 So I was thinking, since random tables (which I'd be using anyway) are basically just lists of "banked" ideas accessed at random, why not bank them in a different way and make a kind of combination DM session notebook/almanac? Each page is mostly just what's already in my DM notebook--a blank book to draw maps I need that day, make notes, tick off monster hit points, etc.--but like those daily planner books they sell it has a few ideas "banked" each day, the same categories every day: weather, Oriental Adventures-type events, that session's theological/astrological situation (Crocodile God ascendant today, bite attacks do +2 damage), etc. -All this stuff is just backup-it's here to supplement when improv is called for. -It's entirely possible none of these notes will be useful in a given session, so I kept it short. The "monster" for example is only there for if whatever else is going on in the campaign that day doesn't spit out a monster when I need one. Ditto the NPC. -This isn't an in-game day-by-day calendar. It goes session by session. -Over on the right of the full page it says FighterFighter (and keeps going FighterFighterFighterFighteron the right hand side of the spread) because Fighter has 7 letters and an average d20-system 1st level fighter has about 7 hit points I use the grid to give monsters i just made up hit points in terms of how many 1st level fighters they are equal to. -It works like this: going from left to right gives you how many PCs the monster's equal to, going top to bottom says what level. You draw a box covering all that territory to get how many points a brute monster (bear, giant, etc) of that profile should have. 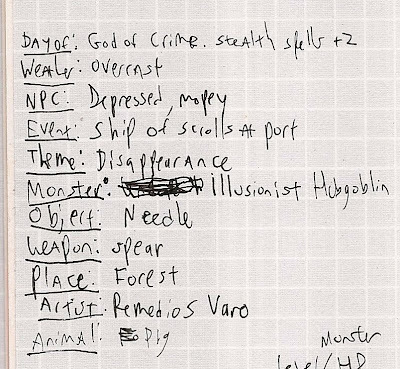 -A wizard or equivalent monster (like a medusa or other mastemindish fiend) has 2 hp per die so you only use the "F" and "I" columns. -I know, confusing, but I've been doing it for years, works for me. Basically--the red box indicates the hit points of a 6th level brute monster equal to a party of 4 PCs. 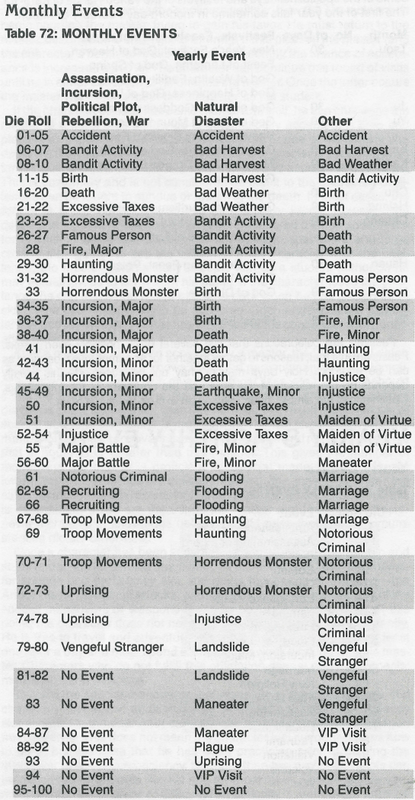 The blue boxes (combined) indicate a 7th-level wizard/mastermind type monster equal to a party of 6 PCs. I did something similar but using only basic data, not adventure hooks. My starting area was on a coast line (well, major river next to a coast line) so I filled out a calendar with categories for weather, high/low tide times, phase of the moon, a note for religious or other holidays, and sunrise/sunset times. 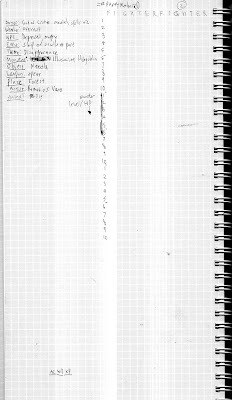 I worked ahead by a week or two, and I'd physically mark off the days. Also, most of the time I'd just steal the data from the real world, and had a bunch of sites bookmarked to look it up on the fly if I hadn't prepped (or the players decided to skip over boring time and used up my calendar faster than expected). 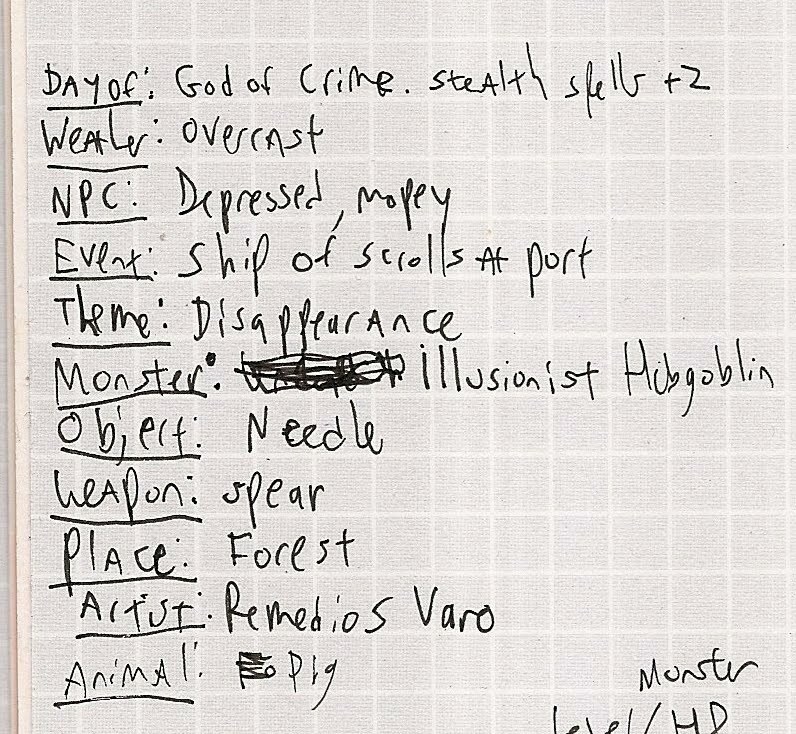 But now I'll add some extra categories, like Zak suggests. Great idea! It has been a long time since I have seen that chart from oriental adventures. I use to make up a calendar, unique to each campaign, to count off the days and keep track of the seasonal changes. I like your idea for a more detailed session guide and especially like the idea of a different god/higher power influencing the daily activities of the party. I also wanted to add, the chart that you posted also makes a great "What's been happening in this village/area/region since you last were here" chart, too. Interesting ideas Zac. I just bought a copy of OA a few weeks ago. Had been talking to someone about Chance Cards in early Blackmoor ('71-'75) and someone mentioned that table so I bought OA to see it. Arneson's chance cards worked much the same except he wrote out random events on cards and had the players pick from the deck. A second deck contained "gypsy sayings" which were vague prophecies only he knew the meaning of. Ever read or run this adventure?